Strawberry Obsidian is a good grounding and balancing stone. It allows its holder to face their own fears and challenge their anxiety so that they see that it was not needed. Strawberry Obsidian helps one realize the areas in yourself that needs changing. Obsidian is a natural glass that forms when lava goes into water. Although it is a natural glass, it has dye in it to create this breath-taking red color.It stimulates the root chakra and validates self-worth. 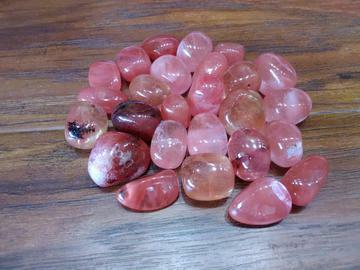 Strawberry Obsidian balances the male and female energies. It also blocks psychic attack and removes any negative spiritual energies.